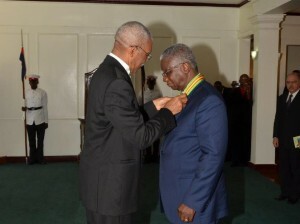 President David Granger, who is Chancellor of the Orders of Guyana, today, conferred Prime Minister of Barbados, the Right Honourable Freundel Stuart with the insignia of the Order of Roraima, Guyana’s second highest National Award. The Ministry of the Presidency said the investiture ceremony was held at State House, the President’s official residence. The Prime Minister was bestowed with this honour in recognition of his support for the rights of Small Island and Low Coastal Developing States, his advocacy for CARICOM’s demand for reparations for the citizens of the Caribbean Region and his contribution to the reduction of the impact of climate change in the Region. He explained that both Guyana and Barbados gained their Independence from Britain in 1966. Barbados will be celebrating its 50th Independence Anniversary in November. Both countries also pioneered the founding of the Caribbean Free Trade Area (CARIFTA) in 1965, even before they became independent and established a joint High Commission in London soon after Independence. Additionally, the two states’ Prime Ministers, Forbes Burnham and Errol Barrow, were among the four ‘founding fathers’, who signed the Treaty establishing the Caribbean Community in Chaguaramas in 1973. The Guyanese Head of State said that Prime Minister Stuart is known for combining his country’s legendary leadership in regionalism with the international activism necessitated by the changing circumstances of the 21st century Caribbean. “We applaud Prime Minister Stuart’s leadership and stewardship. We commend him for his commitment to the Caribbean Community,” President Granger said. 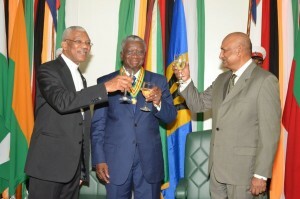 Meanwhile, Prime Minister Stuart said that he receives this honour with much gratitude and humility. “It is an important moment for me. I have been a follower of Guyana for many, many years. I’ve been influenced quite a lot by what is happening in Guyana over the years. I was a great admirer of the late President of Guyana, Forbes Burnham and therefore to have been the recipient of this award this morning is a real humbling but delightful experience,” he said. Speaking about bilateral and trade relations between the two countries, the Prime Minister said that said concerted efforts are being made by both nations to improve and strengthen the Guyana-Barbados Joint Commission. He said that both countries can learn much from each other; noting that Barbados as a leader in tourism in the Region, stands ready to assist Guyana to further develop its own tourism industry. On the other hand, the business community in Barbados can benefit from significant investment opportunities in Guyana. 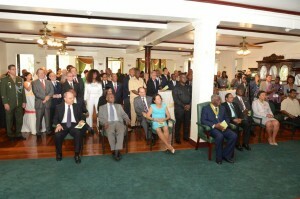 The gathering at State House- Seated in the front row right are: Minister of Public Security, Khemraj Ramjattan, Commonwealth Secretary General, Baroness Patricia Scotland, Prime Minister Moses Nagamootoo, Prime Minister of Barbados, Freundel Stuart, First Lady Mrs. Sandra Granger, Minister of Foreign Affairs, Carl Greenidge and another dignitary. Prime Minister Stuart is the holder of Bachelor of Arts degree in Political Science, a Bachelor of Law degree with honours, a Master of Laws degree in Public International Law and is the holder of a Legal Education Certificate from the Hugh Wooding Law School. He became a Member of Parliament in 2008 and served as Attorney General, Minister of Home Affairs and Deputy Prime Minister until his appointment as Prime Minister in 2010. Also present at today investiture ceremony, were Prime Minister Moses Nagmootoo, Cabinet members, Commonwealth Secretary General, Baroness Patricia Scotland, Advisor on the Council of Ministers of Suriname, Ambassador Harvey Narendorff and the diplomatic corps. Last evening at the 50th Independence Anniversary flag raising ceremony held at the D’urban Park the Government announced the list of outstanding Guyanese to be conferred with National Awards this year. Among the awardees include: Ambassador Ronald Austin, Director of Edward B. Beharry and Company Limited, Inderjeet Beharry, Former Opposition Leader, Robert Corbin, Justice Yonette Cummings-Edwards, Consumer Advocate, Pat Dial, Dr. Carl Hanoman, Former Vice Chancellor of the University of Guyana, Harold Lutchman, Director General in the Ministry of Foreign Affairs, Audrey Waddell and Speaker of the National Assembly, Dr. Barton Sctoland among others.